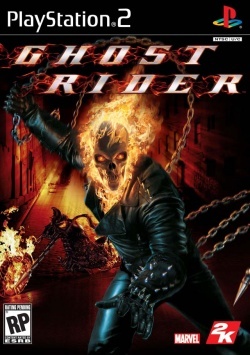 Game description: The Ghost Rider feature film follows superstar motorcycle stunt rider Johnny Blaze as he strikes a deal with the vile Mephistopheles for the most precious of commodities - his immortal soul. Now Johnny Blaze is forever destined to ride night after night as the host to the powerful supernatural entity known as the Ghost Rider. The video game continues the storyline, dropping players into the role of Blaze as he is transformed into a super hero with powers to avenge any evil he encounters. Featuring many of the characters and motorcycles from the comic book and movie, Ghost Rider engages gamers in an immersive, supernatural third person world with a seamless blend of hand-to-hand combat and high-speed motorcycle action. The game's storyline is drawn from the movie, and was penned by Marvel writers Garth Ennis and Jimmy Palmiotti. Players can play as Ghost Rider both on foot, or on the Hellcycle. The villains are both from the movie and the comic, including Scarecrow, Deathwatch, Lilith, Blackout, Vengeance and Blackheart. This game works ok and looks pretty good too. It runs slightly on the slower side but Vu cycle stealing makes it go really fast without any serious bugs. This page was last edited on 25 December 2016, at 17:53.